Steam users will soon be able to listen to their local collection of music while they play games with Steam Music, Valve announced recently. 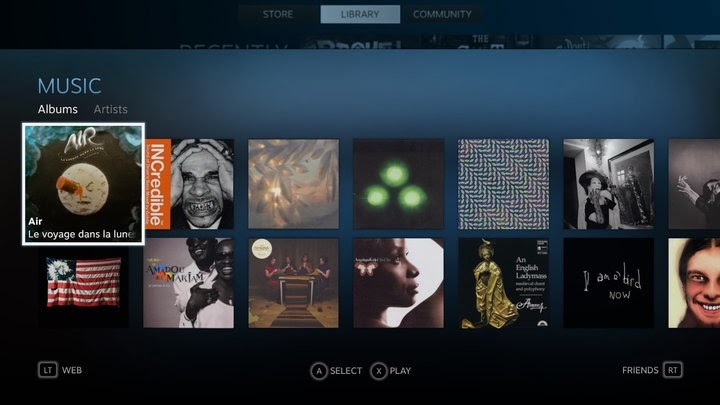 The feature will allow people to point Steam to the directory of music on their computer's hard drive, and from there, Steam Music will present them with a navigable layout of their entire music library akin to software such as iTunes. Users will be able to play tracks and albums through Steam Music by accessing the audio player from their controller's guide button or from the main menu in Steam Big Picture. Features include the ability to create and manage playlists, and sort a library by album and artist. Valve will soon launch a beta of Steam Music for Big Picture and SteamOS, with integration in the desktop version of Steam coming afterward. According to Valve, the beta will offer "what we believe to be the most fundamental set of features to offer a great music listening experience within Steam." Interested parties can see more screenshots on the announcement page for Steam Music, and join the Steam Music group on Steam Community to have a chance at beta access. Steam Music appears to be separate from Valve's previous announcement saying that streaming music, movies and TV shows are coming to Steam. We're reaching out to Valve for more details, and will update this article with any information we receive.